...Is to fit a free-flowing exhaust system. The stock Jeep Cherokee 4.0 exhaust is very restrictive. Much of that restriction is in the crushed stock front exhaust pipe (it necks down from 2.25" to as little as 1.75" in diameter at the bends) and the stock catalytic converter. The best solution is to replace THE WHOLE EXHAUST SYSTEM with a tubular header/front pipe, high-flow catalytic converter, and a high-flow muffler with tailpipe (cat-back). The result is a gain of 15-20hp. Borla Exhaust produce stainless steel long tube headers for the '91-'99 Jeep Cherokee XJ and '91-'06 Jeep Wrangler YJ/TJ that come with an amazing 1,000,000 mile warranty. Gibson Performance Exhaust also produce shorty smog-legal, heavy duty headers with the options of chrome plating, stainless steel, or ceramic-coated stainless steel. Clifford Performance 57-2015 "6=8 HEADERS" Jeep Headers 1987-2005 w/ 242 cid (4.0L). Fitment: All 1987-2005 Jeeps 242 cid (4.0L). Includes smog fittings. Description: This is a shorty street rod header which includes the header gasket and street hookup kit. Average gains on a stock engine are 18-22% when bolting on this header. By seperating the heat created by the engine in to two collectors, we can increase the life of the engine and make more power with exhaust scavenging. Want to use a single exhaust? Use our universal -Y- Pipe (09-0240) to single out the exhaust to bolt to your stock exhaust system. Banks Torque Tube Exhaust Manifold Assembly. With more power, quicker acceleration and tougher construction than ever, the Banks TorqueTube® for the Jeep 4.0 liter out muscles any competitive exhaust manifold: period! Made from super-durable, mandrel-bent 409 stainless steel tubing and sporting a ½"-thick precision ported and machined flange. Powering through the roughest terrain is no longer a question. Borla Performance Industries catalytic converter back T-304 stainless steel systems are made for race, street, and off-road. Systems include a full welded case high-flow muffler, mandrel bent tubing, and polished stainless steel tip(s). Gibson Performance Cat-Back Stainless and Aluminized Exhaust Systems for Most Domestic and Some Import Model Trucks and SUV's. A Variety of exit locations. Larger tubing and a high-flow muffler allow your engine to breathe easier creating an increase in power as well as mileage! Limited Lifetime Warranty. Rusty's Offroad features Flowmaster Delta Flow & Cherry Bomb Pro Mufflers. Many people ask us why Flowmaster & Cherry Bomb Pro Mufflers? Well their performance is proven and there is no other muffler that will hold up to the elements of off roading, they are built like skid plates and hold up to the beating of rocks and stumps. The Rusty’s mandrel bent 2.5 inch tail pipe keeps the exhaust flowing for maximum horse power, improved fuel economy and a performance tone. Mandrel bends offer 35 to 40% increase in flow compared to stock bent pipes. Mufflers and pipes are completely aluminized. System comes complete with heavy duty exhaust clamps. Will work with both 4.0 & 2.5 engines. * 01 models require cutting of muffler flange. Cut on the muffler side of the flange where muffler is welded, about 2.5" behind flange. Then slide the muffler onto the 2.5" extension. These kits will work on U.K. versions of the XJ as well. "FLOWMASTER MUFFLERS and exhaust systems deliver unequaled performance no matter what you drive"
Dynomax offers the widest selection of performance mufflers on the market. With a muffler for every performance application, Dynomax has it all: sound, performance and durability. Options galore! Aluminized or stainless, singles or duals, oval or round, with or without tips. 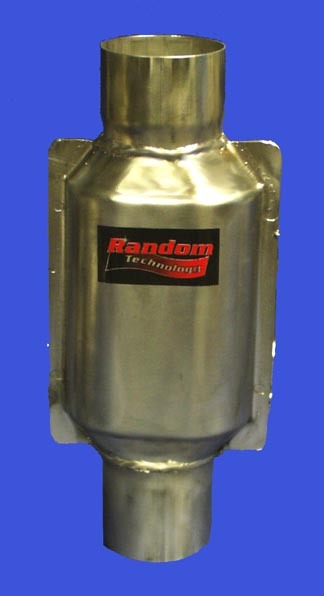 The one stop for all the mufflers, tips and converters you need.